For those of you wanting to give your girls extra room to roam free, the Mansion Run is ideal! It sits up against the Mansion coop allowing you walk from the run into the coop with ease. 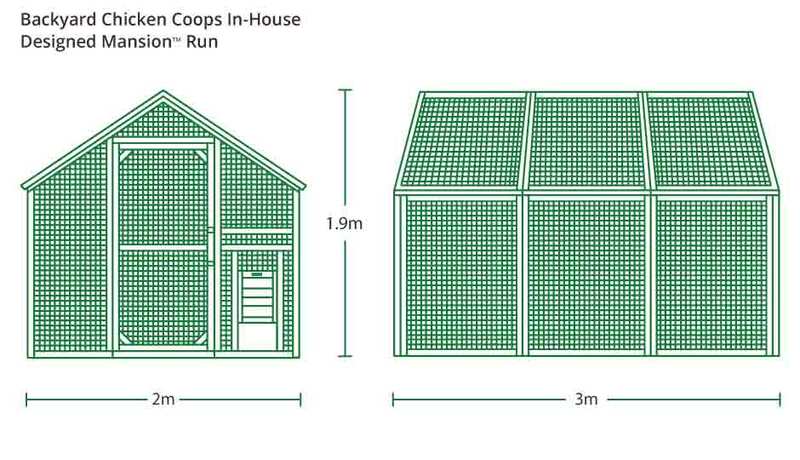 The run is the same width and height as the Mansion coop and is 3m in length. Made from pine, with 10mm x 10mm galvanised wire mesh fixed to the side, it allows plenty of ventilation whilst protecting your hens from predators. Alternatively if you would like to use the enclosure as a free standing run not attached to the Mansion coop, all you need to do is fix wire mesh to the back, to complete the enclosure. The Mansion Run extension is the perfect addition to any Mansion chicken coop. It is available for immediate delivery. Our other chicken coops include: The Mansion, The Taj Mahal & The Penthouse. Chicken access door - This door supports the automatic door opener. • The Mansion Run will help keep your chicken flock safe from snakes, poultry predators and vermin with 10mm x 10mm galvanised wire mesh and sliding bolt locks on entry points. • Add Wire Mesh Flooring, an Auto Door Opener, and a handy Predator Sensor Light and your chicken flock will be well protected. • Our chicken runs are constructed from A-grade, kiln dried timber to withstand the harsh Australian climate. • This timber’s strength and durability lets us comfortably offer a full 12 month warranty on our chicken coops and runs. • Your Mansion Chicken Run is delivered in a natural state, ready to be decorated to your taste! Painting your chicken run with good exterior paint will provide a long lasting finish and lets you integrate it into your backyard style. For those of you wanting to give your girls extra room to roam free, the Mansion Run is ideal! It sits up against the Mansion coop allowing you to walk from the run into the coop with ease! • All you need for assembly is included and clearly labelled - no confusing bits! • We make sure all components are galvanised to ensure longevity and durability. • Assembly is a breeze with pre-drilled holes and pre-attached fittings like locks, hinges, latches, wire mesh and doors. All you need to set up your Mansion Chicken Run is a power drill, a phillips head drill bit and a helping pair of hands. Not too sure about something? Don’t worry! Our customer care team is ready help you with any assembly questions you may have. Short on time? We provide chicken run assembly and painting services and we can help you find your flock with our chicken sourcing service! Get in touch and we’ll take care of everything for you, from as little as $329*! Download the product brochure to find out all you need to know about this Mansion Run. Full of detailed information, customer photos, painting tips & so much more! How many runs can I connect together and how? You can connect as many runs as you like together, in many different configurations, it simply comes down to your needs and your creativity :) Here is some customer inspiration. If you buy the run alone we will supply a wire mesh back. How do I connect the Mansion Coop to the Run? What does the inside of the Mansion Run look like? As the run is made with wire mesh, the space is open, giving you complete freedom to setup the run as you please with feeders, bedding, a dust bath, hanging treats, swings, perches and more! What is the height of the side panels on the Run? 1183mm and 1882mm to the roof pitch. How do I protect the Mansion Run from the rain? We sell heavy duty, UV protective shade cloth for the run, however if you need to keep the rain out, we suggest purchasing polycarbonate corrugated roofing - these can easily be removed. While assembly is quite simple - we provide full colour instructions, follow-along video and 7 day assistance - if you are short of time and would prefer someone to do it for you, we'll organise the assembly of your Mansion Chicken Run from $329*.